Phil's Forum for Independent Retailer Success: What Would You Do With...? 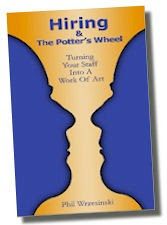 What would you do with 60 copies of the book Hiring and the Potter's Wheel: Turning Your Staff Into a Work of Art? Would you use them to prop up a table leg or two that is out of balance? Would you use them as a door stop to keep the front door open when the wind blows? Would you try to sell them and make some money? Would you give them out as favors at your next big gathering? Would you wrap them and give them as thoughtful gifts to anyone you knew who did a lot of hiring? Would you have a contest to see who could stack them in the most interesting way? Would you create a wall covering with the book jackets? Would you use them to start a bonfire on your next camping trip? Would you use them to hold down the floor or hold up the dust? What would you do with four hours of time with an award-winning, creative-thinking, trend-setting retailer whose store was named One of the 25 Best Independent Stores in America? Would you use him to train your staff to take Customer Service to levels you never knew existed? Would you use him to give you one-on-one advice on your marketing, your inventory management, your hiring & training, or your financials to help you find the extra $10,000-$20,000 you know is hidden in there somewhere? Would you have him help you uncover your Character Diamond so you will have a blueprint and guide for every single business decision going forward? Would you get him to write you new advertising copy that will drive more of your type of customer through the door? Would you share his talents with other businesses in the form of a seminar or workshop that helps everyone become stronger, raising the tide for all the boats in your area? Would you ask him to bring his guitar and harmonica for a little performance? What if I told you that you could have both for only $1200? That's it. Sixty copies (one case) of my book Hiring and the Potter's Wheel for you to use as you please. Four hours of my time and business knowledge to help you succeed. I'll pay my own way to travel to your location (Continental US only). I'll pay for my own room for one night. I'll bring the books, handouts, and whatever other resources available to me to help you meet your goals. PS In case you're wondering if this is a good deal... I typically charge $1000-$2000 plus travel expenses for a one hour presentation. Books sold separately. This deal is two-fold. First, to help spread my book out to the world. There is a lot of bad hiring going on right now that this book could remedy. Second, I love to help others. The more I get to do that, the more inspired I am to do more.